There was a crash involving a car and a motorcycle on Friday afternoon at the intersection of South Elm Street and Columbus Avenue in Washington C.H. The driver of the motorcycle was taken by EMS to Fayette County Memorial Hospital. Witnesses said the motorcycle was halfway through the intersection when the car hit it. No other information was available at press time. 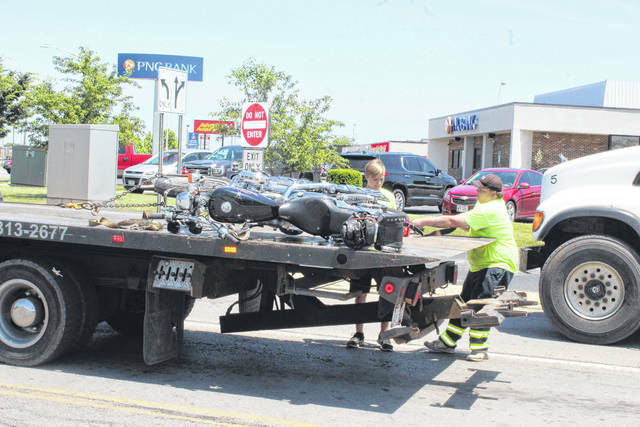 https://www.recordherald.com/wp-content/uploads/sites/27/2018/06/web1_car-crash-motorcyle-loaded-edited.jpgThere was a crash involving a car and a motorcycle on Friday afternoon at the intersection of South Elm Street and Columbus Avenue in Washington C.H. The driver of the motorcycle was taken by EMS to Fayette County Memorial Hospital. Witnesses said the motorcycle was halfway through the intersection when the car hit it. No other information was available at press time.